Hi there! 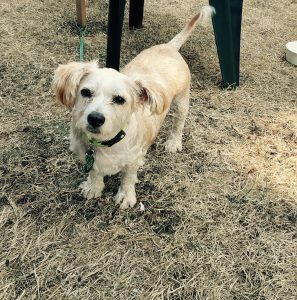 My name is Liam and I am a 1 year old Lhasa/Poodle mix. The name you ask? Well, of course I am named after that handsome devil, Liam Hemsworth. You know he actually stole his style from me? Pft. I am cuter anyways. Especially with my new hair cut thanks to the Pixie crew! I came into the shelter looking a little under the weather due to all my tangled hair. But now I can feel the breeze on my back as I run around my foster’s yard, just having the best time! But of course, it’s not all about my good looks. My foster says I am the sweetest and most affectionate pal who loves to be with my people and cuddle in close. I am a very outgoing guy who really enjoys being around my human pals, doggy friends, and those kitties too. And I am also pretty active which could make for a great hiking pal or just a chill dude to hang on the beach with. But if we go to the beach, you have to bring my squeaky toys. Frisbee just isn’t my thing, but playing fetch with those toys-best. time. ever! Sound like your idea of fun too? Fill out an application today, so we can meet. I come to you vaccinated, neutered, and micro-chipped with an adoption fee of $300.